Congress Tentatively Agrees to Wall Funding Democrats First Proposed in DecemberOn Monday, negotiators put forward a $1.375 billion deal for wall funding — a number conspicuously close to what Democrats offered Trump last year. Republicans Keep Admitting Everything They Said About Obama Was a LieWhite House chief of staff Mick Mulvaney confesses the GOP Congress refused to give Obama any successes. Mulvaney: Trump Not Mentioning Debt Because ‘Nobody Cares’Mulvaney used to care a whole lot. Trump Is Already Laying the Groundwork for Another Government Shutdown“It’s certainly an option,” he said Sunday. How John Kelly Failed to Tame the West WingWhat Trump’s new chief of staff Mick Mulvaney is walking into. Why Donald Trump Keeps Giving Mick Mulvaney More JobsTrump can’t find a lot of willing candidates, so he settled for a guy who knows how to brief him using pictures. Glutton for Punishment John Kelly Promises Trump to Stay on Through 2020Some say he’s as miserable as he looks, while others think he’s defying Trump by refusing to quit, but either way, John Kelly’s endurance is weird. Nick Ayers and Mick Mulvaney Said to Be Trump’s Top Picks to Replace John KellyDespite reports that Trump would prefer to be his own chief of staff when Kelly finally makes his exit. After Blowing Up the Deficit, House Passes Mostly Phony Spending CutsThis “spending clawback” bill involves the budgetary equivalent of sofa-cushion money. White House Aide Rewards Paul Ryan’s Loyalty With Talk of Ousting Him As SpeakerRyan, who’s retiring in January, is having trouble controlling the GOP caucus. So why is Mick Mulvaney undermining him with talk of an early coup? Mick Mulvaney Tells Bankers to Pay Up If They Want Favors From Trump“If you’re a lobbyist who never gave us money, I didn’t talk to you.” Uh, are you supposed to just say that? Regulators Fine Wells Fargo $1 Billion for Abusing ConsumersThe penalty is the largest that the Consumer Financial Protection Bureau has ever imposed on any lender. The 8 Zaniest Things About Trump’s Flipping and Flopping on the OmnibusWhether or not Trump is just pitching a fit, or blowing up months of negotiations, it’s all very … wacky. White House Learns Tip-Robbing Plan Will Rob Waiters. Guess What Happened Next.They … felt terrible and changed their mind about the plan? 4 Reasons to Ignore Trump’s BudgetTrump just signed a congressional budget deal on Friday. His own budget was out-of-date even as it was being printed. The Trump Administration Just Made Life Easier for Racist LendersMick Mulvaney has taken enforcement authority away from the federal office that specializes in punishing discriminatory financial firms. The CFPB Is Now the Predatory Lender Protection BureauThe consumer bureau just dropped an investigation into a firm that allegedly preyed on the poor — and definitely donated to Mick Mulvaney. Mick Mulvaney’s Plan to Neuter Consumer Watchdog Comes Into FocusA noted hater of the Consumer Financial Protection Bureau, Mulvaney has spent the last several days weakening the watchdog. Mulvaney Can Lead CFPB, But the Legal Battle Over the Agency Is Just BeginningThe new acting director has wide latitude to begin reining in the agency, but it’s likely the administration will face new legal challenges. The Consumer Financial Protection Bureau Was Designed to Stop Donald TrumpThe first agency built to withstand regulatory capture is put to the test. 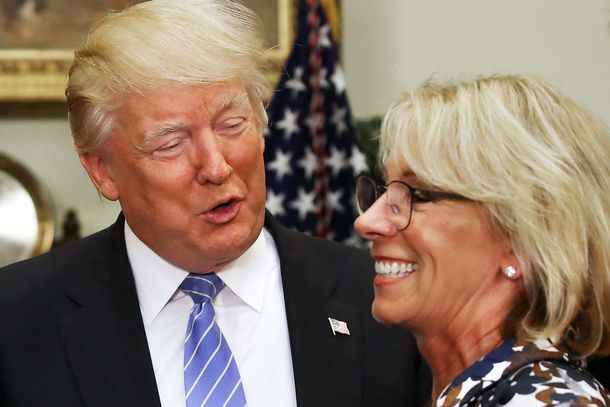 Battle Over Trump’s Pick to Lead Consumer Watchdog Agency Heads to CourtA Consumer Financial Protection Bureau official is suing the Trump administration, arguing she’s the rightful acting director, not Mick Mulvaney. Trump Won’t Be Able to Defang the CFPB Without a FightThe president’s plan to put Mick Mulvaney in charge of the Consumer Financial Protection Bureau — without Senate confirmation — might be illegal. Mick Mulvaney to Run Consumer Watchdog Agency He HatesTrump’s budget director once called the Consumer Financial Protection Bureau a “sick, sad joke.” Now, he’s the CFPB’s interim leader. Bushonomics Is Back Because the GOP Has No Other IdeasLet’s try cutting taxes and hoping it leads to spending cuts — that always works. Trump and White House Keep Up Attacks on San Juan MayorThe president continues to respond to the humanitarian crisis in Puerto Rico with defensiveness and insults. 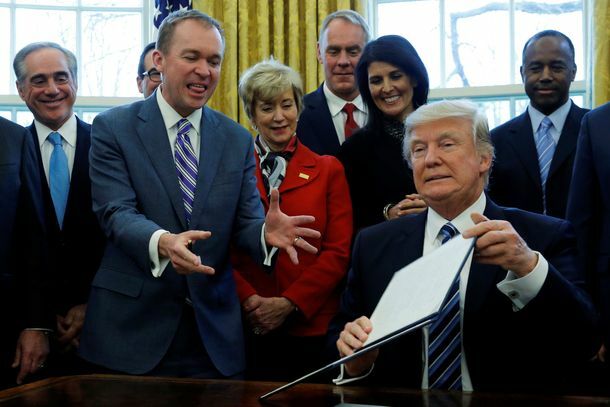 Trump’s Budget Director Declares War on MathIn the same interview, Mick Mulvaney also attacks the Congressional Budget Office as biased and admits his own numbers are completely fabricated. Trump Official Incompetently Defends Administration’s CompetenceMick Mulvaney tried to explain how he hadn’t actually made a math error — and ended up suggesting that he doesn’t know the basics of Trump’s tax plan. Trump Budget Director: We Didn’t Make a Childish Math Error! (They Did. )Mick Mulvaney: I can explain that mysterious $2 trillion mistake! Here’s How to Tell That Trump’s Budget Doesn’t Care at All About Poor PeopleForget what Trump does to programs liberals think help poor people. Look at what he does to programs Trump thinks help poor people. The Trump Budget Is Really Just a Cynical PloyThe draconian spending cuts will never pass Congress. But Trump is preparing excuses in advance for when GOP tax cuts balloon the deficit. Trump Budget Based on $2 Trillion Math Error [Updated]Literally the largest and stupidest arithmetic mistake in the history of the federal budget. GOP Will Hold Runoff in Race to Fill Mick Mulvaney’s Former Congressional SeatDemocratic winner Archie Parnell will face either Ralph Norman or Tommy Pope next month in the South Carolina special election. There Could Be a Ton of Drama in Washington This WeekPossibly a government shutdown crisis, the return of Trumpcare, and the unveiling of the president’s tax-reform plan — or none of the above. Mulvaney Pushes ‘Sanctuary City’ Crackdown That May Lead to Government ShutdownTrump’s OMB director has tossed another inflammatory issue into the mix. Trump Budget Director Admits Their Goal Is High Inequality, Not Low DeficitsMick Mulvaney says the quiet part loud. Trump Budget Director: Health Care for All Actually Means Jailing PeopleMick Mulvaney explains that Trump’s promise to cover everybody means mass imprisonment so he has to break it. White House Says Cutting Meals on Wheels Is ‘Compassionate’“I think it’s probably one of the most compassionate things we can do,” Mulvaney said, of slashing funding for food assistance to the elderly. Trump Budget a Blast From the Conservative PastTrump’s budget outline is a very conventionally conservative document wrapped in bristling “America First” packaging, but not a very serious proposal. Trump’s Budget Director Playing Key Role in Obamacare Replacement DramaFor Mick Mulvaney, this is part of the big project of privatizing Social Security and Medicare. Mick Mulvaney’s Job Will Be a NightmareWith no time to spare and no margin for error, the new OMB director must somehow give Congress guidance after resolving his differences with Trump. Senate Confirms Fiscal Hawk Mick Mulvaney As Trump’s Budget DirectorThe now-former congressman has yet to meet a budget cut he doesn’t like. Trump’s Budget Director Choice Is Ominous Sign of Conservative Extremism to ComePicking tea-partier Mike Mulvaney for the key post indicates Trump will go after domestic spending with a fury.